12 plays over 4 days ! English-speaking theatre groups from mainland Europe present one-act plays in competition! The Marcel Huhn / Bruno Boeye Memorial Award for stage-management went to In Players International, Amsterdam, with Virtual Reality by Alan Arkin, directed and stage-managed by Sandy Topzand. The DAW-Verulam Award for best original script was presented to Stuart Marlow for This Side of the Gestapo. The Don Luscombe Discretionary Award went to the same production by the Anglophone Collaborative Theatre of Stuttgart, directed by Raluca Urea. The award was given for creative use of imagery and video. The Grand Duchy Trophy for best stage presentation was given to the American Theatre Company, Brussels, with Spoon River Anthology by Edward Lee Masters, adapted and directed by Christopher Flores. The Blackie Award for best male actor was awarded jointly to Brian André and Eli Thorne of In Players International, Amsterdam, in Virtual Reality by Alan Arkin, directed by Sandy Topzand. The Blackie Award for best female actor was earned by Felice Becker of New English American Theater, Stuttgart, for her Eve in The Diaries of Adam and Eve by Mark Twain, adapted by Elton Townend Jones, directed by Charles C. Urban. 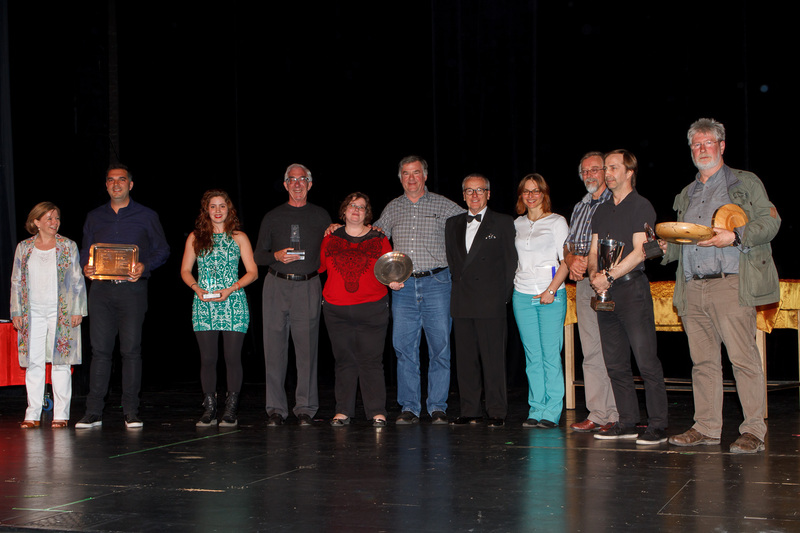 The BATS Trophy for third best production went to the New World Theatre Club, Luxembourg, with The Strange Horseman by Michel de Ghelderode, directed by John Brigg. The ECC Centennial Cup for the second best was awarded to the Stockholm Players for their production of The Dice by Forbes Bramble, directed by Nigel Harvey. The Founders' Trophy for the best production of FEATS 2015 was presented to In Players International, Amsterdam, with Virtual Reality by Alan Arkin, directed by Sandy Topzand.